Looking to the monument from outside, it seems like an ordinary mosque with a tomb and two minarets, but what makes it so different and valuable is the breathtaking interior design, with millions of small mirror and glass pieces covering the walls and ceiling of the temple. Therefore, Shah Cheragh Mausoleum is known as the magnificent mirrored mosque in Shiraz. Let’s take a deeper look into the history, design, and other aspects of this unique monument. The shrine of Ahmad ibn Mousa known as Shah Cheragh, who is one of the descendants of the prophet of Islam, Prophet Muhammad is one of the most important and largest shrines in Shiraz. Ahmad ibn Mousa is actually the brother of Imam Reza and the son of the seventh Shia Imam. Ahmad ibn Mousa was martyred along with a large number of his relatives during his trip to the city of Tous, the headquarters of the Abbasid Caliph Mamoun, on the order of this autocratic ruler in 2nd century AH. He intended to meet his brother, Imam Reza, the 8th infallible successor to Prophet Muhammad, who had been forcibly taken to this city. The tomb of Seyyed Amir Mohammad, the brother of Shah Cheragh, is also located in the eastern corner of the shrine and decorated with mirrors. The sepulcher of this tomb is made of silver and has been chiseled by highly skilled Iranian artists. The tomb of Ahmad ibn Mousa was discovered in the 11th century and a mausoleum was built over it. During the 14th century, a major project on the monument was commissioned by Queen Tash Khatun, the mother of Shah Abu Ishaq Inju, the last ruler of the Injuid Dynasty. The project of repairing and extension started in 1344 and finished by 1349. The additional sections, includes a hall of audience, a college, and a tomb for the queen herself. Also, a unique Quran was also presented to the monument. Whilst the structures set up by the queen is no longer in existence, the Quran that she presented has been preserved, and is today housed in the Pars Museum in Shiraz. During the rule of Shah Ismail I in the 16th century, this mausoleum was repaired. However, ninety years later, following an earthquake, half of this mausoleum was destroyed and was later renovated. In 1827, the Qajar ruler, Fath Ali Shah Qajar, presented an ornamental railing for the tomb. In 1958, the original dome was removed, due to the numerous cracks on it. This was replaced by an iron structure in the shape of the original dome, which is lighter, and expected to last longer. 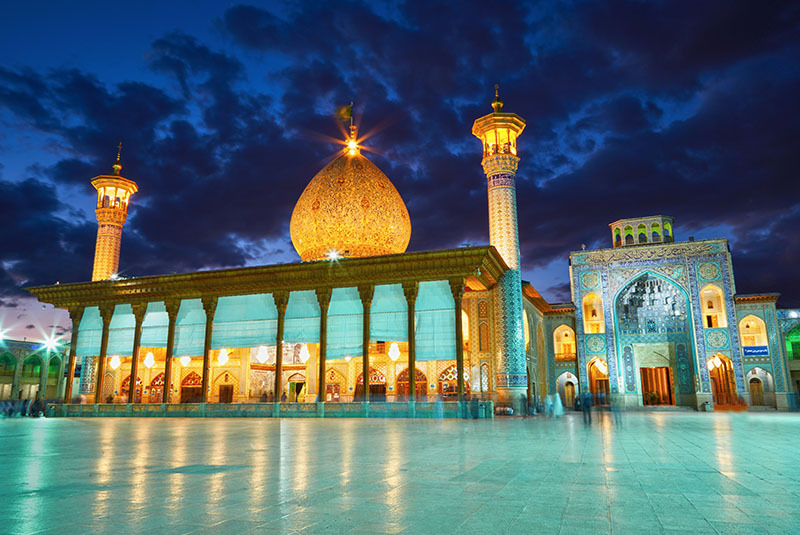 Following the victory of the Islamic Revolution in 1979, the shrine was widely renovated. Its courtyard and sanctum were expanded. 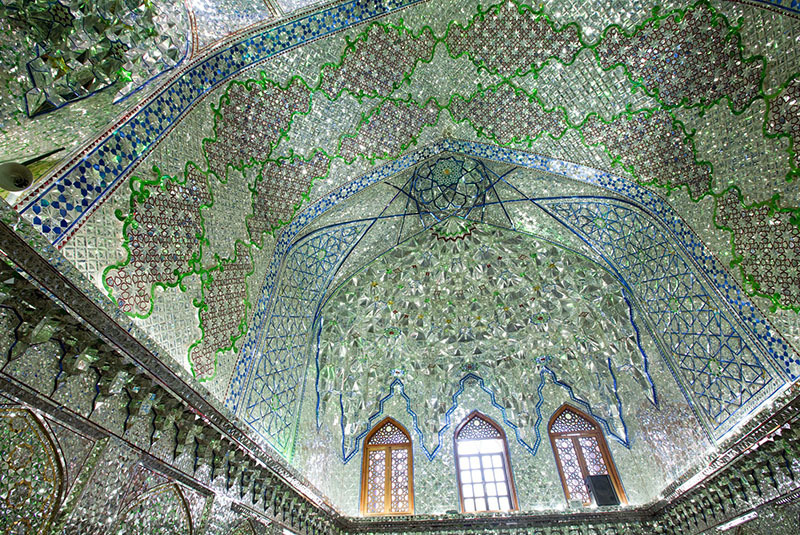 The current Shah Cheragh Shrine includes a porch and numerous chambers linked to the tomb. The shrine’s architecture, mirror decorations, calligraphies, plasterworks and the silver doors of the porch are valuable examples of this Islamic artwork. In 1940, the Shah Cheragh Mausoleum was registered as the national monuments of Iran. It worth to know the name of Shah Cheragh which literally means ‘King of the Light’ refers to the circumstances in which a grave found and later this shrine established over that. It is said that the discovery of the site is attributed to Ayatullah Dastgha’ib, who, according to tradition, used to see, from a distance, a light being emitted from this place. Out of curiosity, he decided to go closer and investigate the source. He founded a grave in a graveyard, and began digging, and found a corpse wearing a suit of armor. There was also a ring, with the inscription “al-‘Izzatu Lillāh, Ahmad bin Mūsā”, which meant “The Pride belongs to God, Ahmad son of Musa”. Thus, it was by this means that the grave of Ahmad was discovered. The interior design of the enormous dome is inlaid with hundreds of thousands of finely-crafted tiles, while the interior walls are covered with pieces of dazzling and pale glass intermixed with tiles colored green, yellow, red and blue. The decorative work in a mosaic of mirror glass, the inscriptions in stucco, the ornamentation, the doors covered with panels of silver, the portico, and the wide courtyard are most attractive. The tomb, with its latticed railing, is in an alcove between the space beneath the dome and the mosque. And this custom of placing the tomb in this position, so that it is not directly under the dome, is to be seen in other famous places of pilgrimage in the city of Shiraz and may be considered a special feature of Shiraz shrines. The shrine is beautiful at any time of the day but especially at dawn and night time when you can admire the beauty of the reflected colors and lights of the tiles.